Escape to a tropical island or…to the Polynesian Resort Wisconsin Dells! 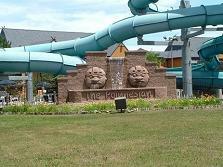 The Polynesian is one of Wisconsin Dells original resorts and water parks! It is also one of the most affordable and budget friendly resorts in the Dells. If you are looking for a smaller, more contained resort, then the Polynesian is your ticket. Still, the indoor and outdoor water parks cover over 200,000 square feet. Please note that while the entire resort is suitable for all ages, kids ages 12 and under will take pleasure in the water fun and activities! The Polynesian Resort Wisconsin Dells hosts over 300 guest rooms with the price including entrance into the water park. Our suite opened to the pool area, which made it convenient for the entire family. Rooms are equipped with microwaves, television, mini refrigerators, and upgrades if you wish. The Polynesian Resort Wisconsin Dells was the first to introduce an indoor water park, and now they also have an outdoor water park to compliment. It has 4 acres of water activities like Coconut Cay, Pali Plunge, Splash Island, Net Walk, Lava Lagoon, Lazy River, and Bora Bora Bay, just to name a few! But it’s not just for the young, it also has an outdoor Tiki Bar for all of you adults. The indoor water park at the Polynesian Resort has over 38,000 square foot of water excitement. The boys had a great time in the Aloha Pavilion playing water basketball, and spent time on the rides like the Temple of the Black Pearl. Another indoor play area, features two 2-story waterslides, Blackbeard's Dark Tunnel Mystery Voyage Lazy River, the Water Factory, and two whirlpools. One of the favorites that keep kids coming back is the bucket of water…you guessed it - a full bucket of water is dumped on everyone down below! As I said, if you’re looking for a smaller, more contained resort, then the Polynesian Resort Wisconsin Dells is the resort for you. The Aloha Bar and Grill offers a menu of great sandwiches, subs, pizza, ice cream and easy and friendly family foods. The Lani Kai Bar offers all your soda, and tropical drinks. Both areas are open at 11:00 am on weekends, so if your young children are hungry before then, bring your breakfast foods or try one of the local breakfast favorites. The Polynesian has two game/arcade rooms. They also have a dry play area/room for young children, which have mats, legos, table work, toys, etc. The Tahiti Trader Gift shop sells everything from snacks to clothing and is conveniently located near the main lobby area. The Polynesian also has an exercise room, which can be utilized by guests ages 16 and older. Check in at 4 pm, but welcome to use the facilities until room is ready. Check out is 11 am, and the same applies. Call 800-272-5642 for information, discounts, rates and reservations. Click on Polynesian Resort Wisconsin Dells for more information. Directions to Polynesian Resort Wisconsin Dells: From I 90-94, take exit 87 towards the Dells on Hwy. 23. Drive one very long block and take the first left. Follow Frontage Road around to the hotel.